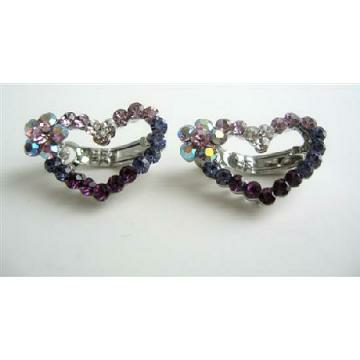 This light and dark Amethyst barrette hair clip is very cute. It has got tiny round flowers to each of the Amethyst and crystal hearts. Each is meticulously made with attention that meets our high standard requirements Add pizzazz to your hairstyle with the latest craze in hair jewelry! These sparkling Crystals are dazzling catching every color & light ray & adding just the right touch to your evening or formal occasion. The uses for this item is endless!It is carefully made & has excellent craftsmanship. all stones are glittery & flawless. This hair Pin/clip is high quality. It is good for people with any amount of hair. Buy Amethyst Heart Barrette Austrian Crystals Hair Pin Clip, sold & shipped by Fashion Jewelry For Everyone where you can shop online for Leading Online Retailer for Indian Fashion Jewelry. This Brooch, Pins & Bands collection has been tagged as barrette, hair clip, rhinestones, hair pin.